This was the leftover. The stand in, the understudy that usually never gets the spotlight. I made two tarts, one with a pretty, fluted edge, the other roughly, haphazardly patched together with the remaining scraps of dough. This was, to reiterate, the latter. The afterthought. Yet, I'm fond of it. I'd even say that its imperfection is its charm. Its saved grace is really through no talent of mine, but rather owed to the recipe for the crust. It's the Whole Wheat Pastry Dough from the book The Sweeter Side of Amy's Bread(Wiley, 2008), and it's one to keep handy. My quiche thanks my friend for sending it in my direction. I'll interrupt myself for a moment, as I can't make, eat, or even consider quiches without mention of her remembrance, that the introduction of quiches and tarts into my life is something I want to attribute to an aunt of mine. The instinct is possibly incorrect, but she has the nostalgic credit. She wasn't an aunt by blood, but by friendship, one of those people in your life that was simply there, from the very beginning. A thought of her brings the smell of Yardley's English Rose perfume, the particular accent of her voice, and the time she let me dictate from memory a recipe for double chocolate cookies. By that I mean, I was five years old and most assuredly making it up as I went along, but she made the biscuits just as I said, and even pretended them a triumph, even though they were stuck irrevocably to the pan. That aunt, she made quiches. Sausage rolls too, and we'll get there someday. Her quiches were always the same, or at least in my memory they were, eggs and cream with bacon. Nothing fancy. We'd eat them cold, straight out of the fridge or soon after. Then there would be tea, and maybe a butter biscuit from the navy tin she kept on the kitchen table. So when I made our lunch, there was bacon involved, with thin rounds of squash and a sweet tangle of shallot, some grated Parmesan for resonant salinity to balance the lull of cream and egg, all poured into a whole wheat crust. We're back to that. This pastry, unlike those cookies, is an actual triumph; heavy with butter, granted a freshness from cream cheese well matched to the whole wheat flour's gentle nuttiness. The dough goes supple and is quite forgiving as it's worked, which was, beyond my frugality, one of the reasons I thought to cobble together the scraps and use every last bit I could. I'm glad I did, because after lunch I found myself chasing the last of the crumbs off my plate with the tines of my fork. Plucking up those evasive fragments with the tips of my fingers as needed. The pastry is afternoon-nap-dream-worthy, the kind I think the best of dreams, as this is one of the best of pastries. I liked it for its subtlety and substance, for its structure of alternating tender and crisp. I liked how it baked up golden with speckles of brown still visible. It's a good dough to know. A piece I did for Saveur.com, on cakes and decorating. It was such fun to do, and I hope you enjoy it. I'm rather lucky to have collaborated with someone pretty darn special for the inaugral issue of Kinfolk Magazine. It launches July 15. UPPERCASE's summer issue will be out soon; Janine put together a slideshow of some of the content, including a glimpse of my contribution - a story on Peach Melba Ice Pops. Here's to happy days, friends! From the book The Sweeter Side of Amy's Bread by Amy Scherber and Toy Kim Dupree (Wiley, 2008). 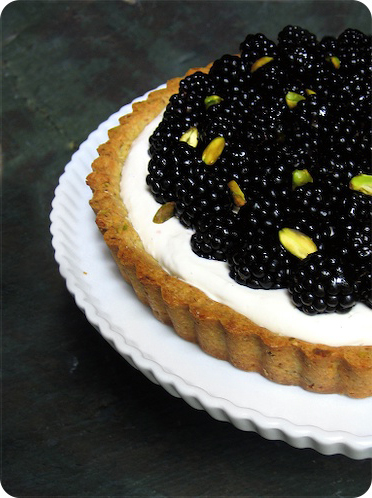 Though I've only talked about the pastry today, the book is a wealth of homey, welcoming recipes. The Pecan Sticky Buns are already famous around here. 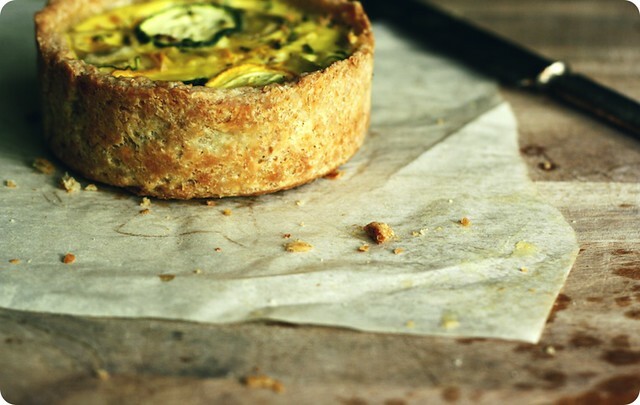 From the authors: The whole wheat flour and cream cheese give this pastry a special flavour and texture that areaperfect complement to our Spinach and Mushroom Quiche filling. This crust is surprisingly light, rich, and tender, so you might want to use the remaining dough scraps to make savory turnovers with any meat and/or vegetable scraps that are hiding in the refrigerator. Freeze the diced butter and cream cheese for at least 30 minutes. In a small cup or bowl, combine the ice water and the vinegar. In a food processor fitted with the metal blade, combine the 2 flours, salt and baking powder and process them until they are just combined. Add the frozen chunks of cream cheese and process again for 15 seconds or until the mixture looks like coarse meal. Add the butter chunks and process again for 10 to 15 seconds, until the largest pieces of butter are about the size of peas. Transfer the mixture to a large bowl and sprinkle it with the ice water mixture. (If you don't have a food processor, mix the dry ingredients in a large bowl with a wire whisk and rub very cold, not frozen, cream cheese into the flour with your fingers until it looks like coarse meal. Repeat the process with the very cold, not frozen, butter chunks until the largest pieces of butter are about the size of peas. If the butter starts to feel soft, freeze the mixture for 10 minutes before continuing. Sprinkle the ice water mixture over the flour.) Using your hands, stir the mixture, pressing it together firmly until it becomes a cohesive ball of dough. There shout not be any pockets of dry crumbs remaining. If necessary sprinkle in another 1 or 2 teaspoons of ice water. Place the ball of dough on a large piece of plastic wrap, seal the wrap around the dough, and flatten the ball to make a round 3/4-inch disk. Refrigerate for at least 30 minutes before rolling it out. This dough may be kept refrigerated for up to 2 days or frozen up to 6 months. Yield: pastry for six 4 1/2-inch quiches or one 9- or 10-inch quiche.